Beatrice Carlson, Peara. 8.25 x 6". 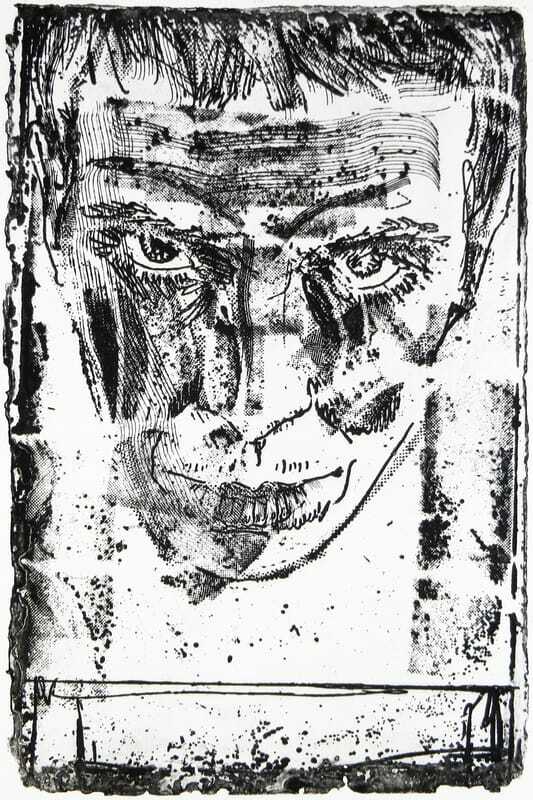 Solarplate Etching. Charles Barth, Ready for More. 8.75 x 7.75". Collagraph. Jon	Goebel, Pursuit of Latitude. 13 x 8". Drypoint and Aquatint. Dennis Worrel, Man on Horse. 11 x 7.5". Silk Mezzotint and Drypoint. Larinda Meade, Rocky 2. 4 x 11.5". 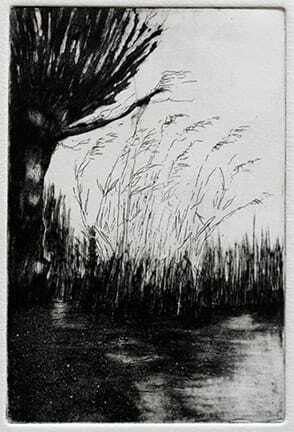 Intaglio Soft Ground. Ana	Fernandez, Subcutaneous Life. 9 x 6". 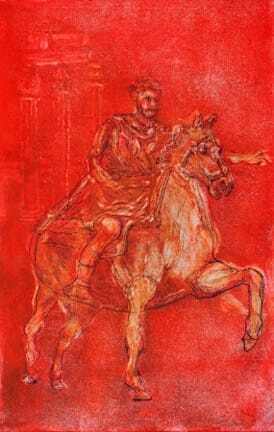 4-color photo-polymer intaglio print with monotype. 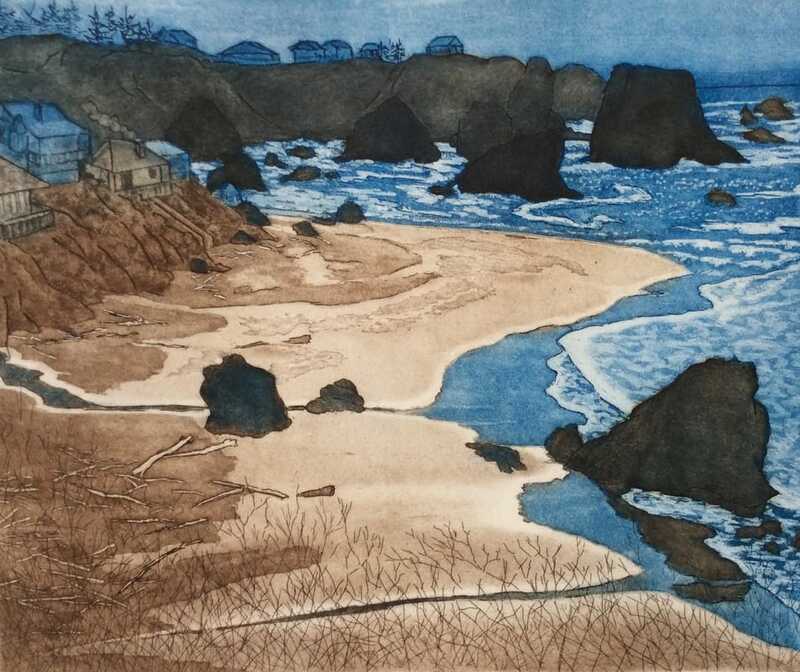 Julianne Ricksecker, Harris Beach, Oregon. 10 x 12". Etching and aquatint. Linda Whitney, Little Jingle Dancer. 9 x 6". 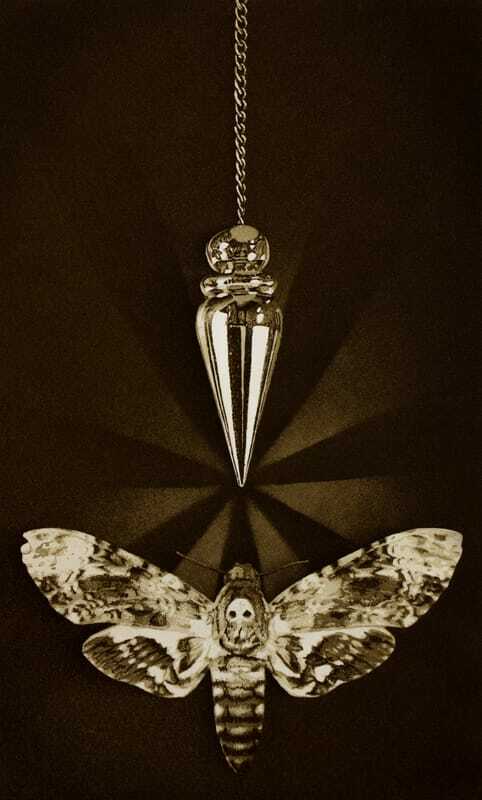 Mezzotint. Peter de Leur, The Ditch. 4 x 6". Etching, Aquatint and Drypoint. Cleo Wilkinson. Elsewhere. 4 x 4". 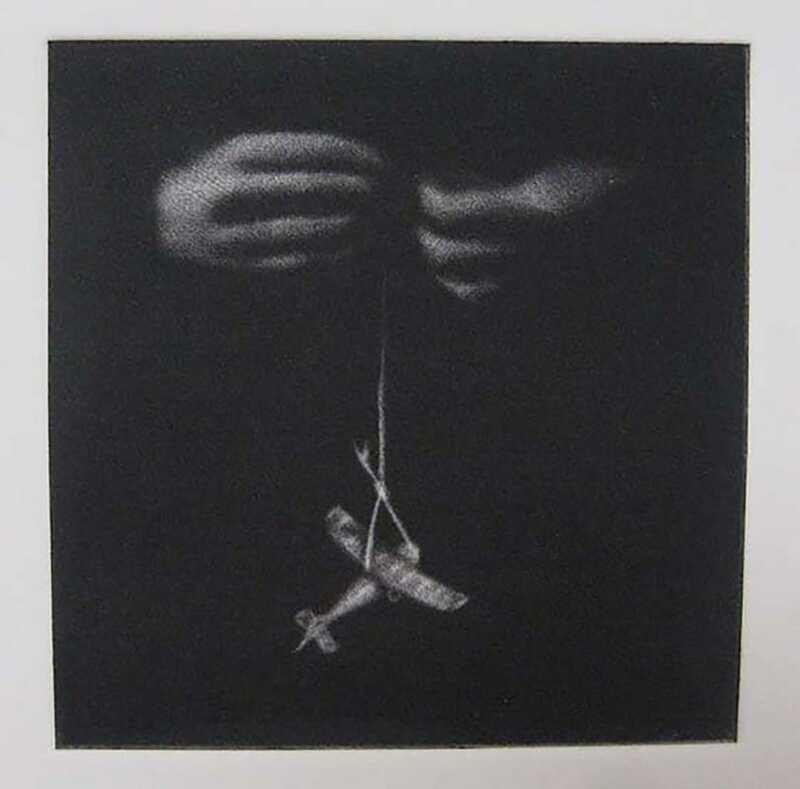 Mezzotint Print. 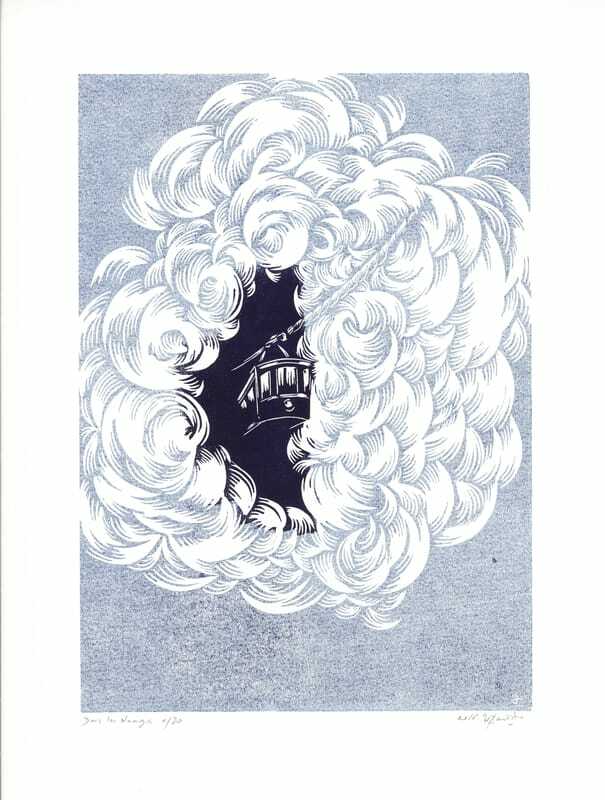 Helene Bautusta, Dans Les Nuages. 19.75 x 15.75". Linocut. Wenije Chen. Travel Notes. 10 x 10". Screenprint. Ashton Ludden, Trend Setter. 11 x 11". Relief Engraving. Marco Trentin, Head of Class. 7.625 x 6.5". Xilografia. Alberto Balletti, Dog's Life 1. 11.75 x 7.875". Etching. 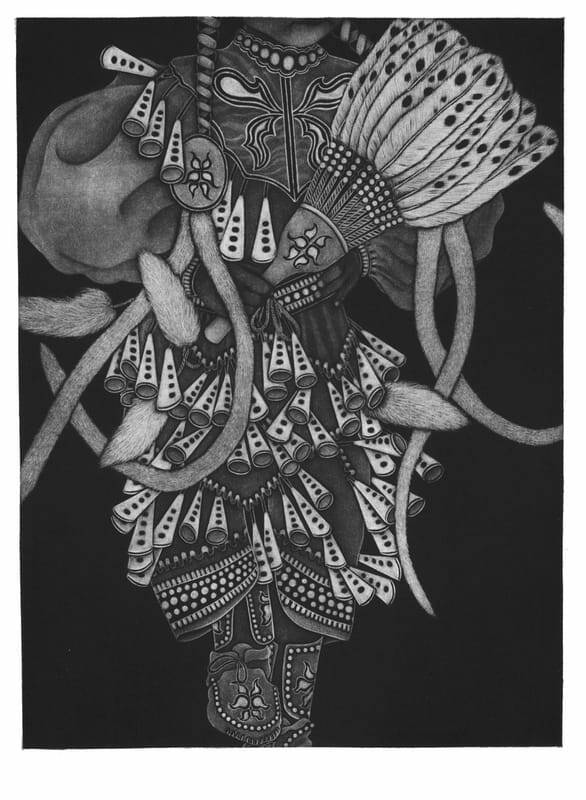 Robert Fitzmaurice, Trappings. 7 x 9.75". 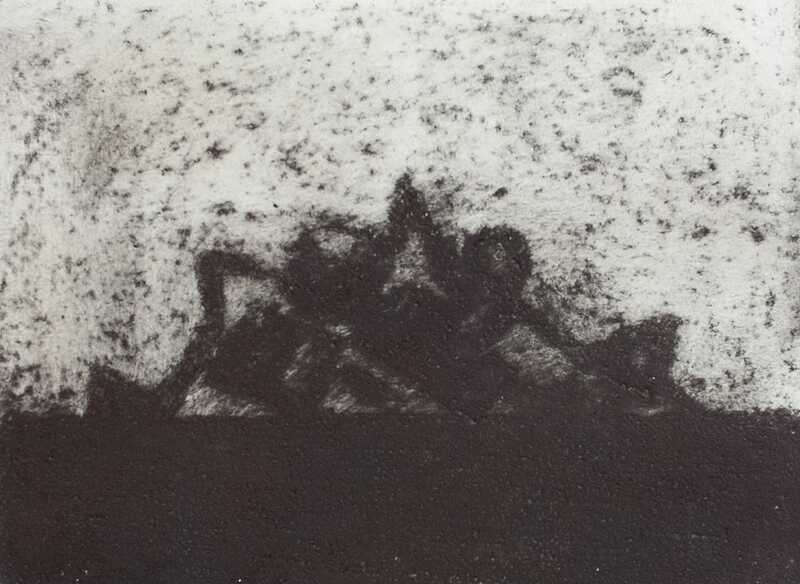 Carborundum Print. Terry Vatrt, Taking Flight. 11 x 8". 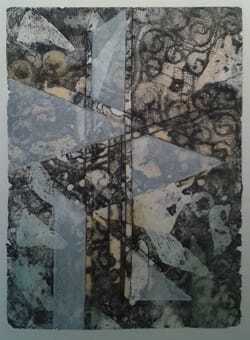 Intaglio, aquatint, mixed media. 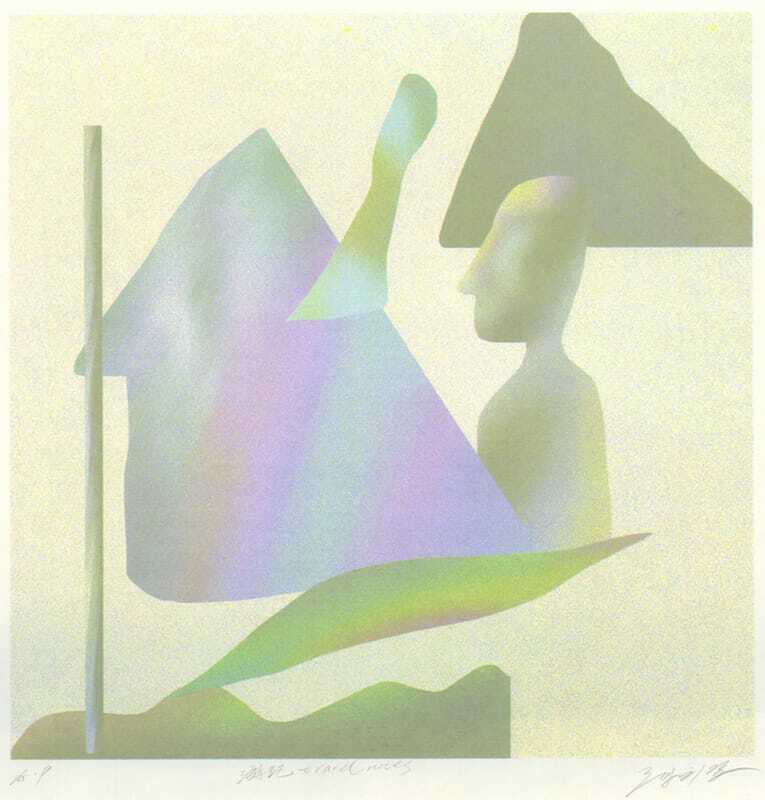 Kristina Key, Aquatint IV. 5 x 9.75". Copper Etching, Aquatint. Printmaking is alive and vibrant—an active, global vocabulary that remains vital and relevant, even when the techniques employed are centuries old. Printmakers continually embrace new approaches and techniques, never losing sight of the centuries-old dialogue begun by those earliest cave wall stencils and relief prints. 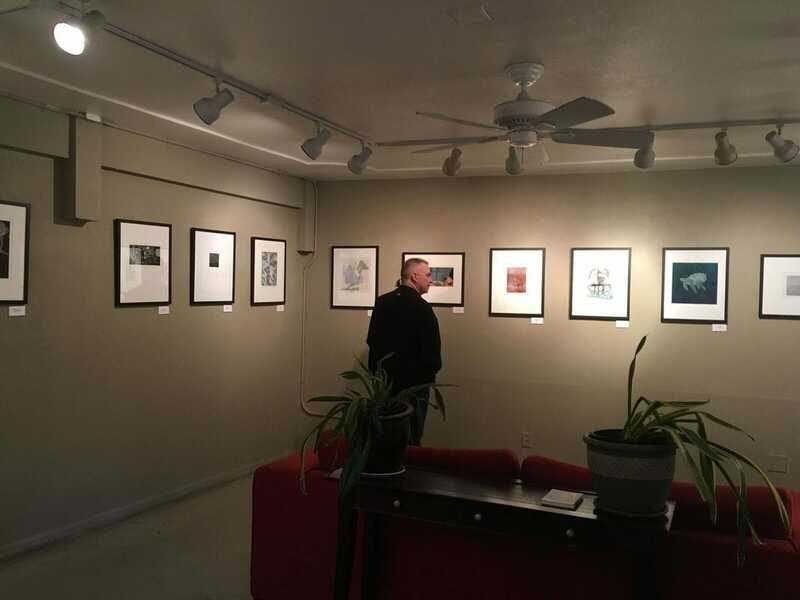 Albuquerque itself has an especially rich history in print, and this is the 4th year New Grounds has hosted the International Printmaking Exhibition, an exhibition that features selected works submitted by artists from nearly every corner of the map. 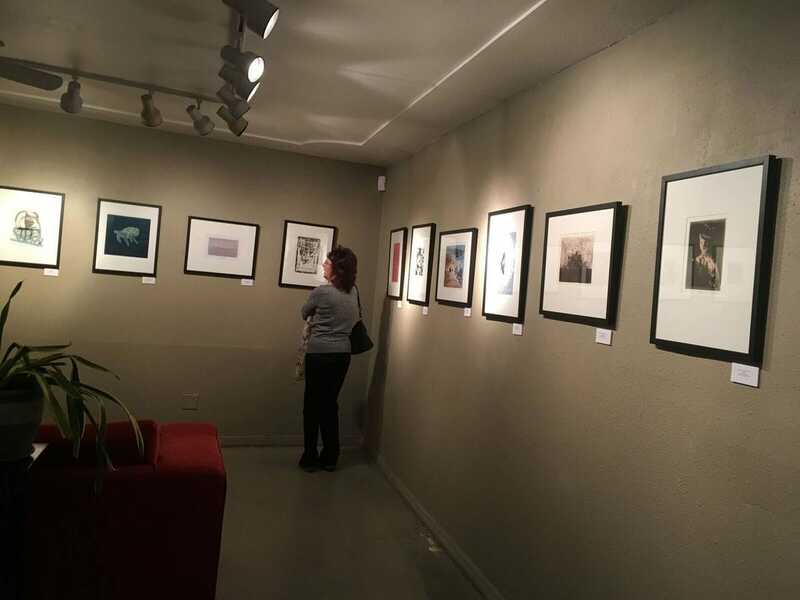 I am proud to have served as the juror for this exhibition, not long after my own printmaking mentor, Yoshiko Shimano juried an earlier show, and it was a treat to review such a rich variety of marks. 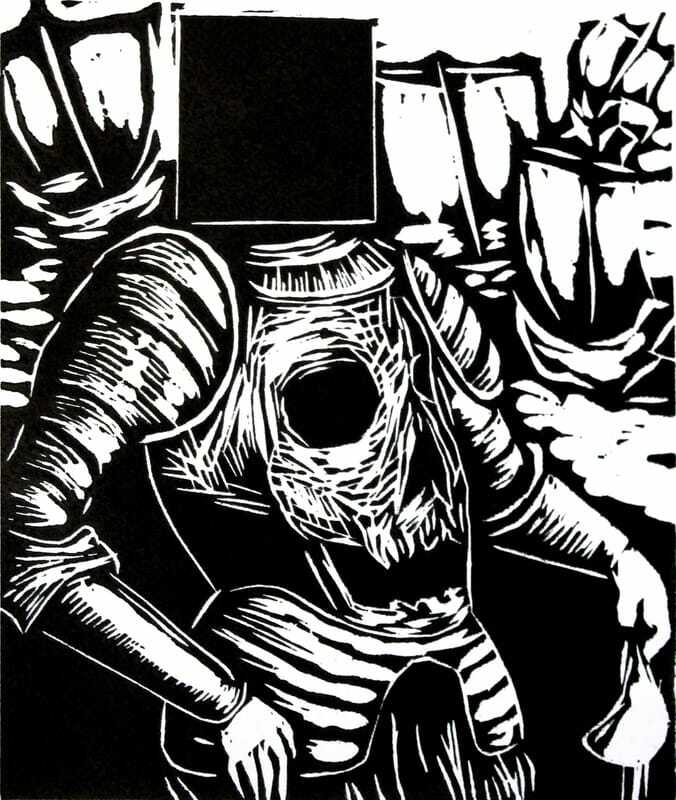 William Kentridge describes printmaking as a process that leaves a trace behind. 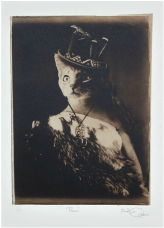 I expand this to suggest we printmakers develop imagery and concept on a plate, then transfer the memory of that original engagement to the paper, not unlike the way our brains record life memories and moments00mnaking printmaking capable of great depths. We create, capture fleeting moments, preserve them as imprints, (traces), while the original moment romantically passes from existence, not unlike our everyday exchanges. As artists, we pursue this desire to make an imprint, to sustain this language of memory and engagement that refuses to die, and in fact, becomes ever more relevant with each movement in the present. 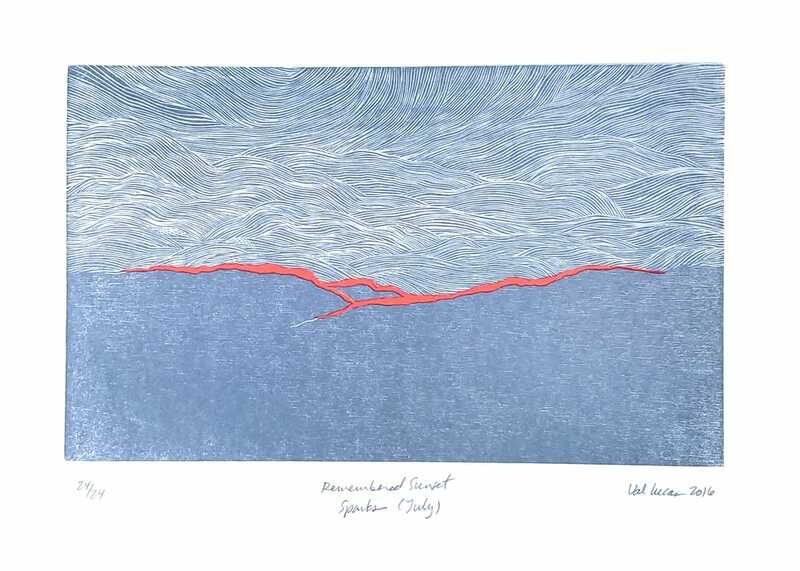 Printmaking is political, social, collaborative, communal and increasingly relevant. 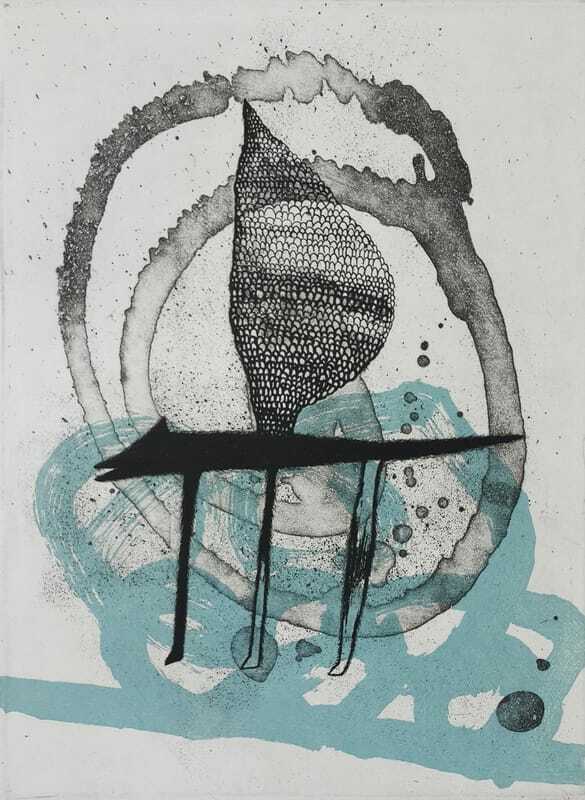 Therefore, presenting an exhibition that offers insight into what printmakers around the world are engaged in, the kinds of forms they’re creating, is an opportunity to tune in to an international voice—vital to the critical discourse of global art. Originally from Southern California, Ren Adams works cross-media, from visual art installations to hybrid printmaking, writing, video, painting, and sound. 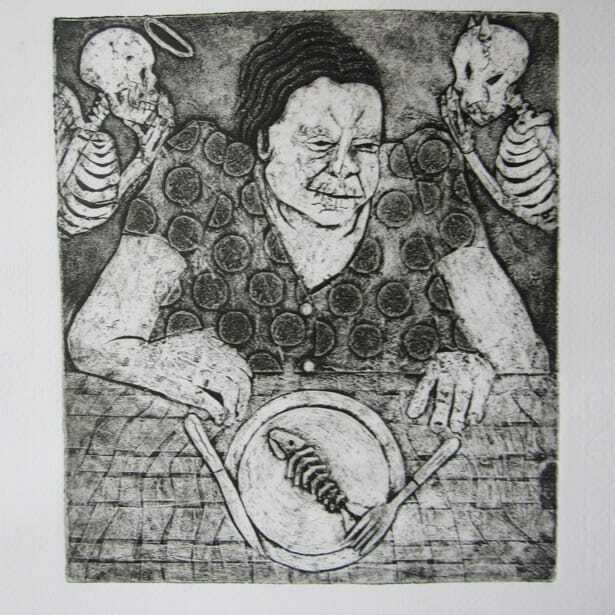 Adams received an MFA in Visual Art from Lesley University College of Art and Design and a BFA in Studio Art (Printmaking) from the University of New Mexico. She also has a degree in English, mentored under Thom Gunn and Charles Hood. An award-winning artist, Adams has exhibited work internationally and regularly publishes poetry, critical writing and images. Her writing appears in numerous publications, including BROAD!, e-ratio, Atom Mind, Tokens: A Subway Anthology, Poetry Motel, Potpourri, The Great Blue Beacon, and Mother Road. 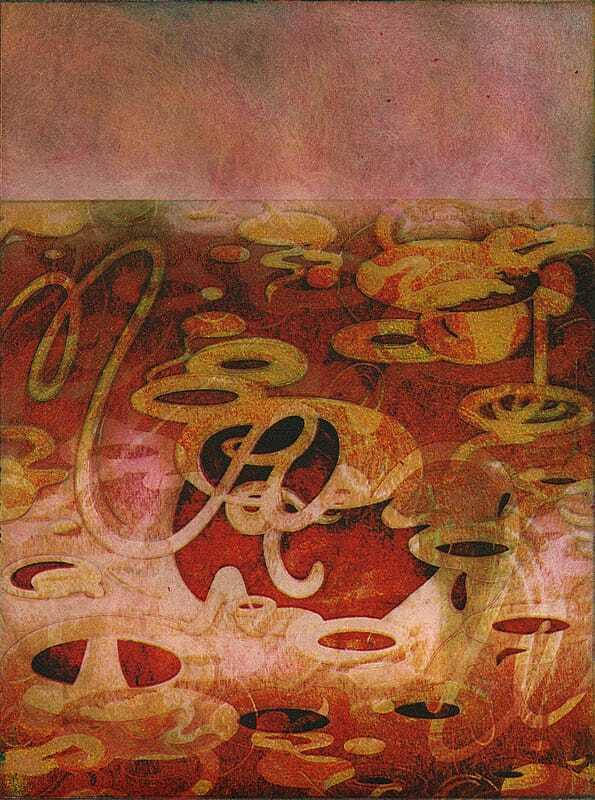 Her visual art has been featured in The Bombay Gin, The Hand Magazine, First Class Lit, Fickle Muses, Box of Jars, Cactus Heart and The Adirondack Review, among others. 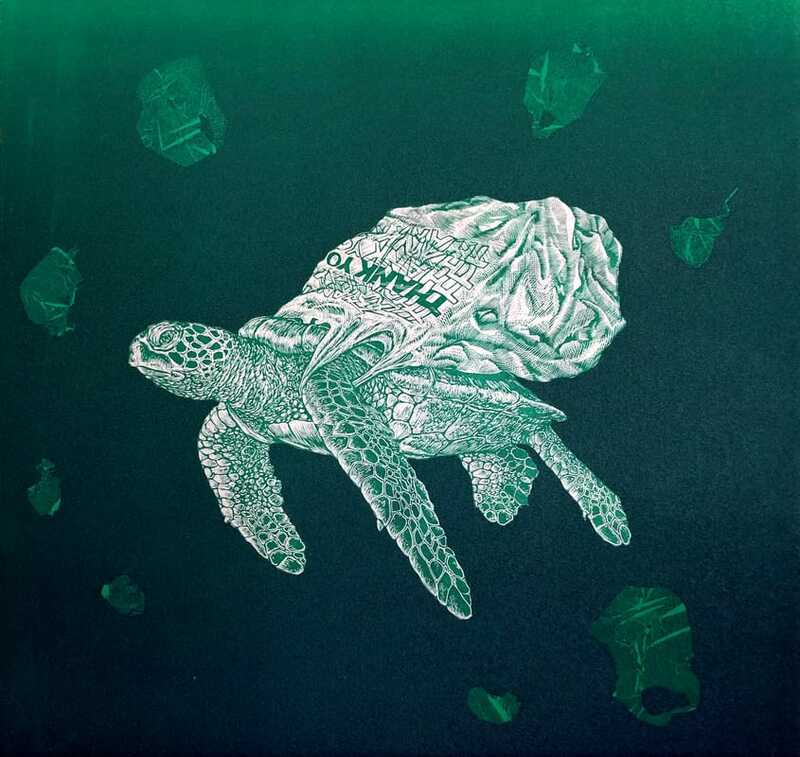 Adams is a UC Berkeley Alumni Scholar, a frequent visiting artist, lecturer, and instructor, and she completed a lithography internship at Tamarind Institute. Recent solo exhibitions include Desert (Loss) (2015) and Alchemy of Image (2014) and the upcoming Whitespace-Bluespace (2016). Adams has juried and curated more than a dozen exhibitions and frequently teaches through the University of New Mexico. 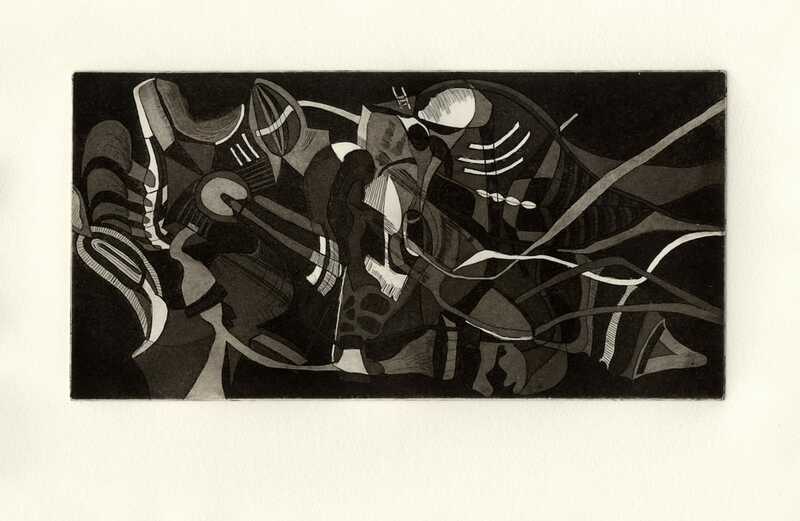 Adams is a member of the New Media Caucus, Southern Graphics Council International and the New England Monotype Guild, and has been the president and coordinator of several regional arts organizations, as well as a resident critic at Lesley University in Cambridge, MA. 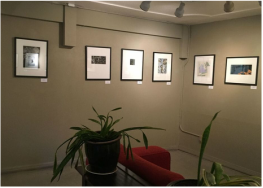 Read and see more about last year's event, the 3rd International Juried Print Exhibition on our blog!